Everyone knows that I am intrigued by train station incidents. A special thanks goes to Venita for sending me this clip. This crazy older lady kicks another woman and throws her hands up to a man. *And this did not occur on the A train I think it was the F! omggggggg she did the superman shirt opening!. 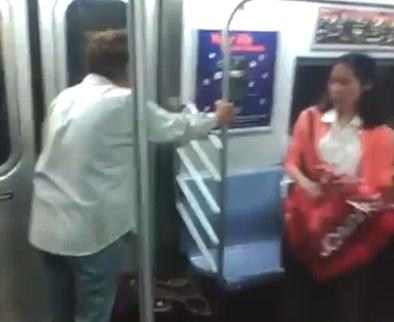 and she slapped her too.. godamn,,that asian lady dont ever wanna ride subway again..
vid needed to be trimmed to main parts tho.